The Type 60 Self-Propelled Recoilless Gun (C) (Type 60 SPRG (C)) is a Rank IV Japanese tank destroyer with a battle rating of 6.7 (AB/RB/SB). It was introduced along with the entire Japanese Ground Forces tree in Update 1.65 "Way of the Samurai". 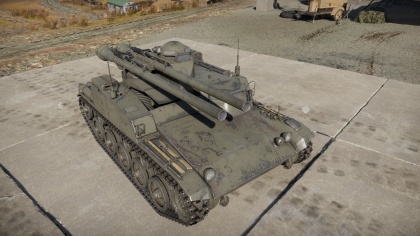 The Type 60 is the first vehicle in War Thunder to implement a recoilless gun as the main armament of a vehicle. The principle role of the Type 60 SPRG is as a short range ambushing "Tank destroyer" where it can make maximum use of its dual 106 mm M40 firepower to best effect, it is better suited to short range engagements and can find it difficult to make a meaningful contributions to the team, on maps where the engagement range is far and distance. 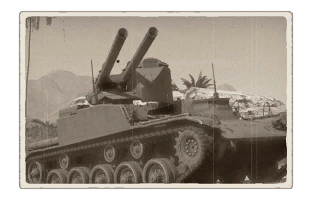 A secondary role for the Type 60 SPRG is as the budget "Light" tank, its is quite nimble with a low profile enabling it to rush to caps and make use of cover, where a large vehicle would not be able to however it is also extremely lightly armour so it is not a very good holder of the cap point. A tertiary role for the Type60 SPRG is to make use of the "reconnaissance" function and mark opposition tanks for team mates which it can see but are too far for it to engage directly its own weapons. The secondary and tertiary roles enable the Type 60 SPRG to contribute to the team even on maps where its unable to directly attack opposition vehicles, however it does make you heavily reliant on team mates taking advantage of your efforts to capture points or mark opposition targets, but it is possible to have decent games in this passive role. It is a small squat vehicle, most of its height comes from the raised platform that houses the twin 106 mm M40 on the left side (facing it). This raised platform enables the Type 60 to have an impressive 20° degree of gun depression combined with a 60° arc of fire to the right and left of the vehicle, however it is also responsible for leaving an open area into the fighting compartment leaving the Commander/Gunner exposed to MG fire. Armour is non-existent on this vehicle only small areas are ~30 mm thick and capable of resisting ~50 cal MG fire, never mind opposition tanks main cannons. While it is quite lightweight at 7.7 tons, the diesel engine is not particularly beefy meaning while quite quick and nimble, you are often left wanting more horsepower when ascending hills and particularly when attempting to escape from a failed ambush or multiple opposition tanks. Suspension wheels are 20 mm thick, tracks are 15 mm thick. Turret column is 30 mm thick. Front and rear turret armour does not fully cover the commander. Ammo racks on the Type 60 SPRG. The Type 60 SPRG is predominately suited to short range ambushes of opposition tanks. It is quite diminutive in stature and relatively mobile allowing it to manoeuvre into position, typically behind a hill, where it can use the impressive 20° degree of gun depression, to quickly pop up and deliver dual 106 mm M40 to a target before pulling back to reload or relocate. The Type 60 SPRG light armour and in some cases absence of armour (open gap in front of the Commander) means that even return MG fire can be deadly, it lives and dies on being able to engage first and retreat thus should be usually played in ambush or supporting the flanks of advancing tanks, it is not a front line "Tank Destroyer". 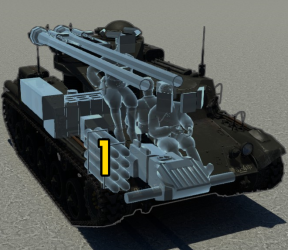 It is possible to use the Type 60 SPG at range using the spotting .50 cal MGs, however the low ammunition count (10) and low muzzle velocity (~500 m/s) of the 106 mm M40 projectiles combined with projectile drop, means you either must be very sure of your aim or located near a cap point for reloading, the usual engagement range should be under 1000 metres. Often it is better to hold fire when you have observed an opposition vehicle to see if they will present a better target and only fire when you are confident you will secure a hits or are about to be discovered. For maps with little to no cover, your best bet is to find some ASAP even if it is in the form of dead tanks. For maps like Maginot, El Alamein or any of the city maps; stay near pieces of cover that blend with your camo lay out. For example, in the cap circle in the main town in Maginot; hide in the little garden area's that are blocked by walls and use this to hide if you are being tracked down or as an ambush position. Remember not to cause to much damage as it will make it too visible and leave the trees up so planes will have a hard time finding you. M344A1 HEAT has impressive penetration with few vehicle capable of resisting a hit but its damage is limited to a narrow cone requiring accurate shooting in order to hit essential components of the opposition tank and in large tanks with spaced out crew (T29), it can struggle to achieve a knock out blow even with both M40s fired. M361A1 HESH has the potential for more damage against opposition tanks but it has significantly less penetration requiring you to be even more accurate with your shots, however the tricky shot of lobbing the projectile onto the roof of opposition tanks can yield rather hilarious results. Recommendation is to use all M344A1 HEAT till you have got used to aiming the weapon then perhaps trial using the HESH approach to see if you get better results. There is no specific enemy for the Type 60 SPRG due to the extremely light armour and in some place absence of armour, agap between the dual 106 mm M40 and the hull in front of the commmander, makes the Type 60 SPRG extremely vulnerable to even return machine gun fire. If at all possible you should approach an opposition target from the left as this will allow the driver's viewing port to extend past the gap in the armour prevent the opposition targets from machine gunning directly into the interior of the tank. HEAT rounds have impressive penetration. Open gap in armour in front of the commander. Light armour barely capable of resisting light machine gun fire. Low ammo count of 10 rounds. Ranging machine gun only effective up to ~800 meters before trajectory with main gun deviate. Extremely vulnerable to strafing by aircraft with no machine gun to return fire. Skins and camouflages for the Type 60 SPRG from live.warthunder.com. This page was last edited on 12 December 2018, at 16:19.